With each show comes a parade of people and equipment. Usually about 3 hours before the scheduled show time members begin to show up on location to get ready for the show. Getting ready involves everyone on the team working together to make sure the show starts on time. 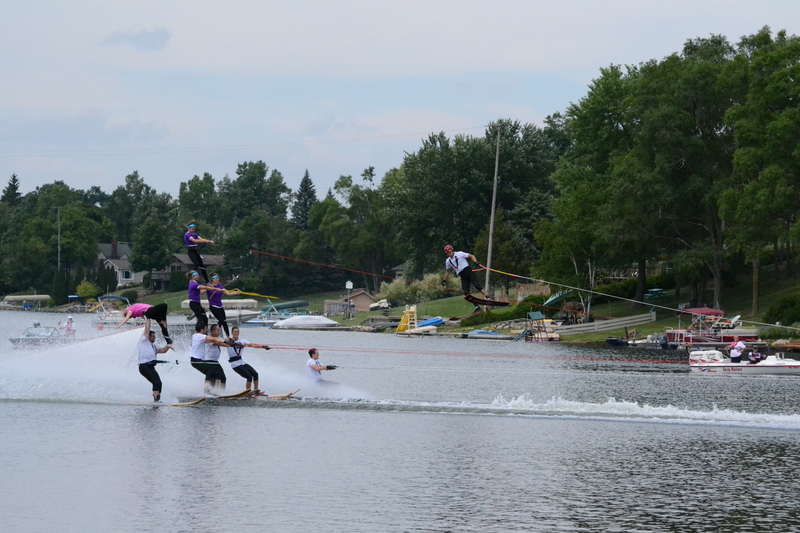 It begins with 3 tow boats being launched, plus a safety “pick-up” boat to haul in skiers who have fallen during the show. Next, 2 floating docks are launched to help set the 4 large concrete anchors (supplied by Advance Concrete – one of our sponsors) that are needed to hold our jump in place. Once the anchors are placed our portable 14ft wide 5 and a half foot high jump is put together and launched with the help of about 10 members. While the jump is being set with the anchors, the rest of the team is busy emptying our double-axle trailer that houses all of our ropes, skis, stage props, and sound equipment. Each pair of skis and each set of ropes has a specific place it needs to be before the show starts in order for skiers to be ready when their act arrives. The last thing that happens before the show starts is when the show director speaks to the entire team letting them know of any last minute changes to the show or any other information related to your specific show site. Finally, after 3 hours of preparation, the show can start. After the show is complete, everything we did to set up is done again, only in reverse. It takes about one hour to break everything down, so in total, it takes all 40 or so members about 5 hours to complete each show we perform from the time the first boat is in the water, until the last boat is pulled out. Of course, this doesn’t include the hours of practice done prior to the date of the show. We begin practice in late February in a gym and move onto the water in early May. Once on the water we practice twice a week every week until the show season is done.